President :: The Union exists to promote golf in the County and to provide competition for the top county players as a route to Midland and International golf. Roger started his Staffordshire golfing career at Bloxwich Golf Club in 1976 playing off high single figures most of the time but his involvement in county golf came about because of his interest in junior golf. 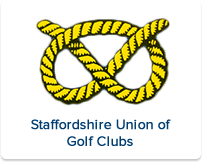 As a schoolmaster in the Walsall area it all started in 1977 when he helped start the Staffordshire Schools Golf Association. Roger went on to become President of the English Schools Golf Association (ESGA) 2004 to 2006. Roger was also invited to join the County Junior Committee in 1996 and accepted the position of Chairman of the Committee in 2001. In June 2011the SUGC Past Presidents asked Roger if he would be interested in the presidency of the Staffordshire Union. Roger was delighted and accepted gratefully. It meant stepping down from chairing the Junior Committee, but he still remains on the Committee and will continue to give assistance. Roger is also a former Chairman of the CGP (County Golf Partnership).